Tutorial: Digital Cut Paper from Scott E Franson on Vimeo. This is a basic tutorial to create a cut paper effect using Adobe Photoshop and Illustrator. I am sorry, The video ends abruptly. I am trying to work out the bugs in the process. Holy Hannah! This really shows me how little I know still. I love being able to see even your keyboard moves. I just wish the window text was readable when you make it large screen. These will be sooo cool though! Darn, I wish it hadn't ended when it did but I really appreciate you sharing this. I have been trying to create all my paths in photoshop but I prefer the pen tool in AI. Now I see how to cross over much more smoothly with your tutorial. THANK YOU. Thanks for the tutorial. I'll look foward for the rest of it. Hope to see you soon Bro. Franson. 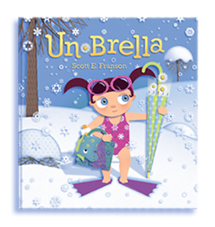 Just thought you might like to know your un brella book was featured on this site. You are amazing! Keep up the amazing work! Missing you!!! Also check out my recently updated look on my blog. Thanks to Jacob Bair who programmed it for me. Thanks, nice that you are posting some tutorials.